Olivia Bax, Zest, 2016. Plaster, hessian, polystyrene, wood, steel, paper, paint, PVA, silicone and armature wire; dimensions variable. Image courtesy FOLD and the artist. Charlotte Barnard talks with Olivia Bax for Traction on the occasion of her solo show ‘ZEST’ at FOLD Gallery. London-based Bax makes large-scale sculpture using gestural processes and domestic materials. 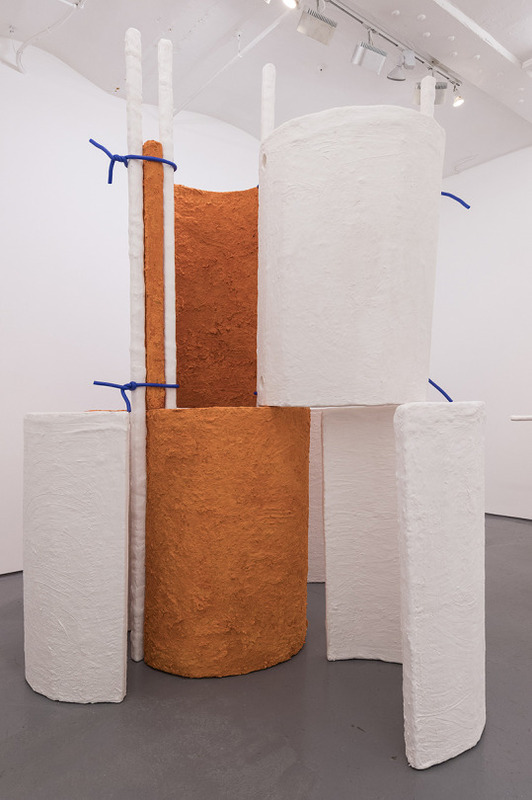 Here she discusses how she navigates form-based sculpture’s relationship to the Modernist canon, testing limits, creating worlds and the influence of her time as an assistant to Caro. I’m interested in the relationship between the work you made for Zest and its’ relationship to the space; its direct references to, and renegotiation of, the architecture of the gallery. Is this negotiation and exchange a prevalent element of your practice, or something that came about for this particular show? I often look at the architecture of the space as the starting point to the work. Then, when I am in the studio, the space can inform the making to a certain degree. For the exhibition at FOLD, I had to consider the practicalities of how to get the work into the space but also how it can belong once it is in place. I am not saying that the work I make is specific to one space, it can exist elsewhere, but as sculpture is about inhabiting and negotiating space, it is an important part of my process to consider the specifics of the architecture of the gallery. Initially, I was conscious that the ceiling in FOLD is relatively low for my work. However, while considering the space, the vaulted roof became an important, if not the dominant, feature. Zest was inspired by the ceiling. The dimensions of the space also seemed problematic for floor-based work, so I made Palisade in an attempt to break the long thin dimensions, to create rooms within the room. But when I came to installing the work, I liked the parts of Palisade bunched up in the entrance. It means that one is immediately forced to pay close attention when entering the space. There is a taste of the work behind but it demands movement in order to be seen. Your work appears to refer to the canon of modernist sculpture, but with a playful irreverence to the seriousness of that era. Is this something that resonates with you? It’s hard to avoid the reference when sculpture has formal qualities. But I am comfortable with the connection. Modernist sculpture was optimistic and powerful. They had to be serious to implement change, and question how people saw and understood sculpture. I am also interested in form, line, space, composition and I want my work to be optimistic. I love making art and testing my limits in the studio. I think it is a privilege having the freedom to be able to spend time on my practice, so I hope the end result is playful. I’m enjoying myself (most of the time)! Art demands such a lot of the viewer, I’m not interested in taking myself too seriously, just making the best work I can within my own means. Could you discuss your relationship to, and engagement with, the materials and processes you use? With the two larger sculptures on either end of the gallery space (’Zest’ and ‘Palisade’) it was important that the components were light, so that I could move the parts easily. In both cases, the armature is polystyrene but the material on its own is too weak to be assembled and de-assembled. It would disintegrate. For over a year now I have been mixing shredded paper (mostly old newspapers) with glue, household paint and plaster, to get a pulp which can be applied to surfaces. I like the texture, the colour, the marks and the inconsistencies. The material makes the armature solid, without making the object heavy. Making components to be installed in the gallery can be laborious, and it is hard to imagine how they will all come together. The plaster wall works in the FOLD show became like sketches, which I could make at the same time as making the components for the larger works. The application of the plaster around the form allows me to understand the (often) quick action and its impact. I find ideas come when I am in a motion or a rhythm the studio. I’ll have an idea for a wall sketch which can be executed there and then, with a sense of urgency, rather than simply drawing it on paper. You use strong, child-like colour in elements of your pieces, which interjects both the white elements of your sculptures and the white walls of the gallery. Could you discuss your use of colour and the importance of how and why you use colour as you do? There are colours which I seem to use often – mostly orange and blue! I think colour can be a powerful tool. It may simply grab attention or highlight an aspect of the work. In the case of the work at FOLD, the paint is an integral part of making the pulp in order to have the correct consistency. The pulp mixture gives the colour a matte quality that changes the appearance of the colour I’ve chosen. The blue of Palisade came first. It was light, so I wanted the next colour to be bold and punchy. I had recently finished a series of monoprints (one of which is hanging in FOLD) which featured a strong orange colour. I found a colour called Pumpkin and it seemed zesty enough. You physically manipulate your materials in a very direct way that draws gesture into the sculpture. The physical actions of your making process are starkly present in the surface of the works. What do you feel this imbues and imbibes in the work? I enjoy that the record of the actions employed in the making of the work are visible on the work. I hope that this speaks of the energy of making and gives the work feeling: a human quality. I find it hard to relate to work which is devoid of any reference of the maker because it seems cold and unrealistic. I like highlighting unique qualities, I think it is more honest. Galleries can be unwelcoming; I hope that my work provides enough details to invite people in. How much did your time working as an assistant for Anthony Caro affect how you perceive and create sculpture? The time I spent as an assistant had an undeniable effect on my work. When I arrived at Caro’s studio, I was mostly using steel. I was struck at how he made work – it is no secret that he did not know how to weld – he was not interested in where there was a weld, or a bolt, or the logistics of joining two bits of material together. Of course, if he didn’t like the way it had been done he would say, but he always had someone else to worry about those decisions. The ‘practicalities of making’ was precisely what began to interest me. If the material was something else (not metal), how could it be joined? I have been exaggerating joints for some time now. At FOLD, the ties are silicon tubes which have armature wire fed through them. So they are not only colourful punctuation marks but they are structural, keeping the work together. Caro had a very infectious way of working, he drew inspiration from everything and everyone. I found it very motivating. He was much more responsive when I moved away from steel and started to experiment with other materials. He was very encouraging and supportive. His last piece of advice was to ‘stop making sculpture and to create a world’ and I think the show at FOLD is my most successful attempt at creating an entire atmosphere where each piece lends itself to the next. You’ve recently begun a residency in Hong Kong. Could you tell me a little more about it? What effect are your experiences having on your practice so far? I am currently Artist in Residence at the Academy of Visual Arts, Hong Kong Baptist University. I will be here for 10 weeks. I have a beautiful studio in the art school which is housed in former RAF quarters. It is built in the colonial tradition and is quite a contrast to the neighbouring high rises and to what is available to artists in London. Hong Kong is stimulating and exciting. I have been struck by the bamboo scaffolding, the DIY balcony extensions outside the high rises, the colours and use of outdoor spaces. I found Reclamation Street in Kowloon on my third day and have been in material heaven ever since. Every shop specialises in a different supply so there is a plastic shop, next to a fake grass shop, next to a copper shop next to a tap supply shop etc. etc. I took my suitcase there a couple of days ago and it was full half way down the street! I will be exhibiting with the other artist in residence, Devlin Shea, at the AVA at the beginning of February.